Let’s face it: Store-bought edibles can be boring. No matter where you go, you’ll find cookies, candy and the ubiquitous brownie. The more adventurous spots may carry savory snacks or — if you’re really lucky — knockoff Cheetos, but you’re never going to find a buffet of medicated foods to suit every appetite and diet. But with the right cannabis cookbook in your collection, you can expand your edible menu beyond pre-packaged foods to five-course gourmet meals — without having to leave your own kitchen. No matter which one you buy, the first 30 or so pages will be the same, offering a beginner’s guide to weed, a dosing guide and recipes for oil and butter, the building blocks of almost every edible. Once the cookbooks lay out the basics, they can get into the good stuff: eggs benedict for breakfast, a New York strip for dinner, and plenty of snacks and cocktails in between. And most of the time, these recipes are good enough to prepare without cannabis. Whether you have the skills to compete on “Top Chef,” or you’re so bad in the kitchen you can barely scramble an egg, there’s a cannabis cookbook out there for you. If you’re new to preparing food with pot, you might as well start with a cookbook that has the word “easy” in the title. Author Cheri Sicard ran a popular recipe website for years, so it was a natural transition for this marijuana activist to write a cannabis cookbook. The Daily Beast once called her the “Martha Steward of Weed,” and until Stewart herself writes a book — and really, we all know it’s coming — “The Easy Cannabis Cookbook” will do nicely. Sicard thinks marijuana is the “unsung superfood,” and adds it to everything from apple-stuffed pork chops to lemon blueberry scones. JeffThe420Chef is considered one of the finest cannabis chefs in the world. The Wake and Bake Podcast host specializes in foods that are high in THC and CBD, but low in that heavy cannabis taste that some people find off-putting. His book also provides instructions for strain-specific butters and oils. Known for his “pot Shabbat” dinners inspired by his upbringing in Orthodox Judaism, “The 420 Gourmet” has plenty of traditional kosher recipes, including his famous potato latkes with canna-pear crème fraiche. Cannabis Now contributor Jessica Catalano is another strain-specific chef — in fact, she’s the world’s first. She first started posting recipes on her Ganja Kitchen Revolution blog in 2010, choosing strains based on the complementary flavors they add to non-medicated ingredients. The website inspired a book of the same name, where Catalano recommends adding Blue Cheese to biscuits, Pineapple Kush to a piña colada, and Sour Diesel to a Lebanese tabouli. If you can’t afford the book, Catalano still posts plenty of free recipes to her blog. It seems like there’s a Marley family member in every branch of the weed industry, and food is no exception. Bob’s eldest daughter, Cedella, is the author of “Cooking with Herb,” a cookbook focused on how the health benefits of cannabis can benefit a holistic lifestyle, whether it’s eaten or consumed in some other way. True to the family’s Jamaican roots, the book is full of Caribbean recipes for dishes like saltfish, jerk chicken and spicy Jamaican patties. But it’s not just a cookbook; Cedella’s volume also features wellness tips and directions for making your own beauty products. Robyn Griggs Lawrence cares about your well-being. As a former editor of Natural Home magazine, she wrote a number of books on healthy living before making her foray into the culinary cannabis world. Her “Cannabis Kitchen Cookbook,” which has a foreword written by Women Grow co-founder Jane West, gathers wholesome recipes and tips from chefs across the country on making edibles that are vegan, vegetarian, raw and gluten-free. 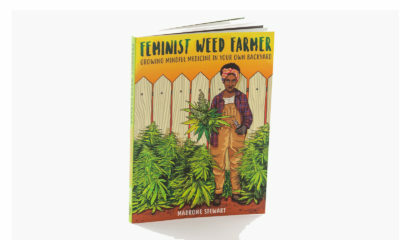 The book includes cameos from Scott Durrah, a co-found of Denver cannabis cooking company Simply Pure, and Catjia Redfern, co-founder of MegaMints, among others. Cannabis Now contributor Laurie Wolf sells small batch cheese crisps and brownie bites at Oregon dispensaries. But if you’re not in the state, her cookbook will help you replicate those treats — and tons of others — at home. With elevated recipes for dishes like a tomahawk ribeye and bruschetta with ricotta and peas, this is the book you should turn to if you’re prepping an elegant dinner party. In fact, “Herb” has been called the “the authoritative volume on how to cook with cannabis” by celebrity chef Michael Ruhlman — who won a James Beard Award for his own book — so you know it’s good. TELL US, do you make edibles from a cannabis cookbook?